We are excited to announce that Hearst Newspapers and Brightcove have partnered to enable its newspaper websites to launch ad-supported Internet video channels, syndication initiatives, consumer generated media campaigns. 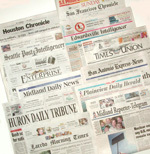 Hearst Newspapers represents 12 daily and 31 weekly newspapers, including the Houston Chronicle, San Francisco Chronicle, San Antonio Express-News, Seattle Post-Intelligencer and Albany Times Union. The first two newspapers to rollout Internet video initiatives will be the Houston Chronicle and the San Francisco Chronicle. Hearst Corporation is also an investor in Brightcove. For more information, here's a link to the full press release.